Around 1962 when this was cut R & B was just becoming soul and Best I Can is a fine example of black music on this edge. Brothers Bobby and Danny Robinson had enjoyed a lot of success with their blues and R & B product and were looking to consolidate with the new gospel led vocal styles. 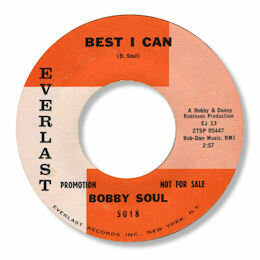 So Bobby Soul was named for the coming genre but the backing retains a few R & B mannerisms - a single tenor sax rather than a horn section for example - but the pianist plays a few church licks and Bobby himself growls and roars. But he certainly doesn't come across as a gospel based artist - more as a refugee from an earlier time. Love those wobbly notes he sings! A very interesting curiosity.